Historically, taffy has been considered an American term while toffee is the term used by the British. Those studying the history of the two believe that both gained popularity during the 19th century. Taffy is considered an earlier rendition of the word toffee, but the word taffy continued to be used in America while toffee was used in Great Britain. Though candy pulls gained much popularity during the 1840s, they weren’t called taffy pulls until about thirty years later. Cookbooks in nineteenth-century Great Britain and American often used both taffy and toffee to mean the same thing, and it usually involved a candy made out of molasses. Most recipes used a combination of sugar and water, along with butter for greasing the taffy pans or in the hands of those who pulled the taffy. Candy pulls were considered to be a great way to entertain guests with a spontaneous party as this was an event that could be enjoyed by young and old alike. 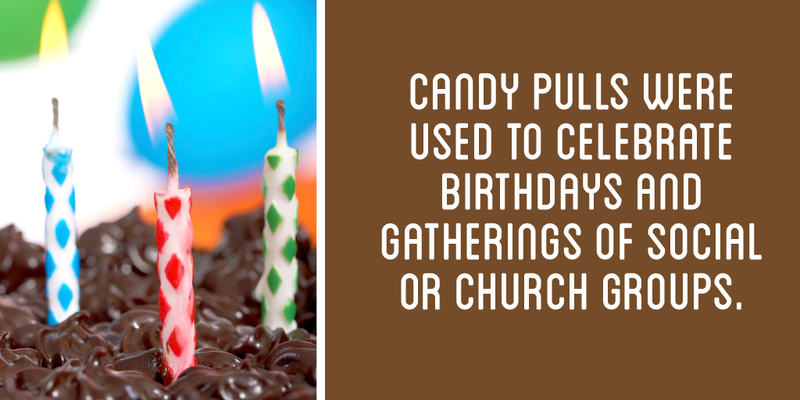 Candy pulls were used to celebrate birthdays and gatherings of social or church groups. Mid-nineteenth century recipes for taffy called for making molasses candy which meant boiling the molasses and then putting it in well-greased pans to allow it to cool. When partially cool, the candy was then pulled until it was a lighted yellowish color. Once this had happened, the candy was then shaped into sticks, ropes, or braids, and then cut with scissors to make drop-like shapes. Molasses and sorghum were good substitutes for sugar which had grown more scarce during the time of the Civil War. Some recipes even recommended that hosts of the party secure a hook to the wall to facilitate the pulling process. Everyone enjoyed this form of entertainment, even the wealthy, who lived along Fifth Avenue in New York. In 1870s America, taffy pulls became a social event. While the attendees were dressed very fashionably, they often enjoyed the evening’s entertainment of the sticky taffy pull. During Victorian times in Wales, there were also taffy pulls, usually around the Christmas or New Year’s holidays. While toffee and taffy are somewhat different, the toffee in Wales was more like American taffy. While there is no documentation on the creator of the first salt water taffy or how it evolved in America after its origin in Great Britain, it is believed that taffy in America was first sold commercially at county fairs somewhere in the Midwest during the 1880s. Since salt water taffy gained its moniker following that offhanded comment after the flooding in Atlantic City, there is really no difference between salt water taffy and regular taffy. There was little or no salt added to the candy over 100 years ago or now. Manufacturers of the candy in seaside towns capitalize on the name of salt water taffy, but there is truly no difference between salt water and regular taffy. Joseph Fralinger and Enoch James were the first popular sellers of salt water taffy in Atlantic City, and their stores still exist along the boardwalk in Atlantic City. Fralinger’s store is still family-owned, and it is the largest manufacturer of premium salt water taffy. When Joseph Fralinger started selling his salt water taffy, he made an investment calculation and bought 200 boxes and filled them with taffy. He was pleased after selling out in less than a day. Enoch James was one of Fralinger’s biggest competitors around the turn of the century. After moving from the Midwest to Atlantic City, James’ competitive spirit was heightened as his store was located close to Fralinger’s store on the Atlantic City boardwalk. Salt water taffy was at its most popular during the 1920s, and there were over 450 companies making the delicious treat. After obtaining the trademark for the name “original salt water taffy,” John Edmiston demanded that the biggest taffy companies pay him for the use of the term. A definitive Supreme Court case in 1923 struck down Edmiston’s claim for royalties because the term had been around too long, and it was used too frequently to be considered unique. In 1923, The New York Times printed an article that discussed the end of blue laws, which prohibited Sunday sales. Five Sundays after the end of the no Sunday sales, a manager of an Ocean City New Jersey restaurant came up with the idea of a candy barbeque. The barbeque featured the distribution of 1,000 boxes of salt water taffy as well as the dispensing of ice cream by other Ocean City residents. The popularity of salt water taffy continues to this day and is a frequent treat of seaside visitors all along the Atlantic Coast. Ironically, the original Atlantic City companies that were once fierce competitors, James and Fralinger’s, have united to form one company. The taffy that sold for $.35 a pound in 1943 is now $8.99 a pound. And to this day, taffy consists of two very basic ingredients that are combined together in some variations: sugar and butter or some type of vegetable oil. The two ingredients are boiled together to create a very sticky substance. In years past, the taffy would then be stretched by hand. The process is labor intensive, and machines complete the process of pulling the taffy today. Turkish taffy was a candy bar that was similar to taffy and came in a variety of flavors. It was made at a factory in Coney Island and sold at a Coney Island amusement park. Made of egg whites and corn syrup, the family that manufactured the taffy emigrated from Turkey. Turkish taffy maintained its popularity throughout the 1940s because it was inexpensive, chewy, and lasted for a long period. Tootsie Roll Company produced Turkish taffy from 1980 to 1989, and the company changed the formula and marketed it as a type of tootsie roll taffy. In 2010, due to popular demand, Turkish taffy was relaunched at the National Confectionary Association Sweets and Snack show in Chicago to replicate the way it was made during the 1940s and up to 1972. It can be purchased to this day. Machines do most of the work in modern taffy making. Long hooks pull taffy, stretching it to help aerate it. Prior to the aeration, the taffy is placed on long metal slabs, where water runs beneath it acting as a coolant. Once the taffy has been pulled, it is put into another type of machine that cuts it into small pieces and wraps it. A small manufacturer of salt water taffy lies in the heart of Brooklyn, New York. The company makes several flavors, including vanilla, salty peanut, and salty caramel apple. Special long-grain salt is added during the production process to ensure that the candy is sweet and salty. Each batch tested for quality, but only natural flavorings are used. Each batch is spread out on a metal table prior to adding the special salt, and then the candy is pulled with the mechanical taffy pulling hooks to provide the needed aeration. Making taffy isn’t simply a matter of mixing butter and sugar together. They need to be boiled together into a very sticky gooey mixture. After this mixture is created, it needs to be pulled and stretched for a long time which can take hours if done by hand. As previously mentioned, there are now machines to complete this labor intensive process which allows the manufacturers to produce much more taffy at a lower cost. A recipe for making Atlantic City Salt Water Taffy appeared in America Cooks: Favorite Recipes form 48 States, The Browns, Cora, Rose and Bob [Garden City Books: Garden City NY] 1940 (p. 569-570) . This recipe calls for combining one cup of sugar, 1 tablespoon cornstarch, 2/3 cup corn syrup, 1 tablespoon butter, ½ cup salt sea water, and flavoring. All ingredients except the flavoring are heated to boiling until the firm ball stage which is 254 degrees Fahrenheit. When the mixture is cool enough to handle, you can add the flavoring. Then stretch the taffy into a 1-inch-thick roll. Cut the taffy into the size which you want and then wrap it in wax paper. The recipe jokingly indicates that it would be a misdemeanor not to use water from the Atlantic. After mixing the sugar and cornstarch together, stir in the corn syrup, glycerin, butter, and salt. Keep the mixture at medium heat until the sugar has completely dissolved. Don’t stop stirring until the mixture boils. It needs to cook until it reaches 270 degrees Fahrenheit. Brush the sides of the pan with a pastry brush dipped in warm water as the syrup is cooking. Once the mixture has reached 270 degrees, remove the pan from the heat and add the flavoring. If you want variety, food coloring can be added along with the flavoring to create colors that match the flavoring. After stirring, the mixture should be spread onto a buttered marble slab to cool. It is essential, especially if you are planning on doing the taffy pulling with young children, that you wait until the taffy is completely cooled before starting the pulling process. It is very easy to burn yourself if you start pulling before the taffy has cooled. Once cooled, the cook should butter his or her hands and find an assistant to help pull the taffy until it is satiny. Don’t use cooking spray or vegetable oil to grease the hands — they simply do not work as well as butter. This is a labor-intensive process and should take no longer than 30 minutes. The pulling creates a smooth, chewy texture. For the taffy novice, it is essential to define the process of pulling. The taffy must be folded, then stretched. 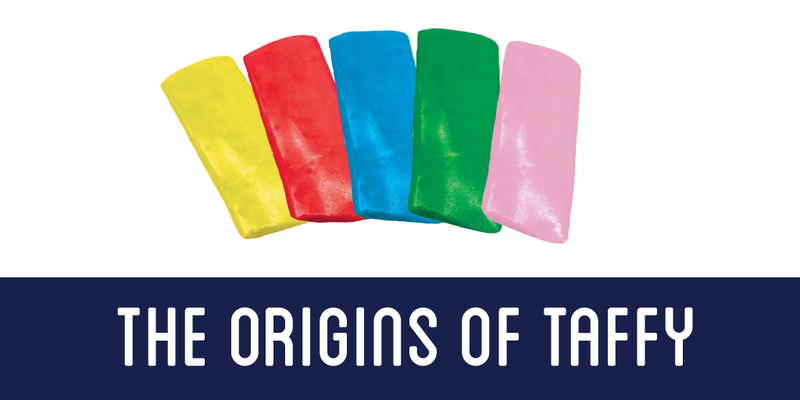 The process repeats until both the color and flavor are the same throughout the taffy. You will need to stretch it into a long rope that gets looped back and stretched again. This process is repeated over and over until you can no longer pull and stretch the taffy because it has become too stiff. If you don’t want to pull the taffy, you can use a taffy hook. They are often available from kitchen stores and can be installed on a kitchen wall. The taffy is then shaped into a long rope and cut into inch-long pieces. They can be wrapped in wax paper after approximately a half an hour. The air temperature is important in the taffy-making process. Even if you’re cooking in an air-conditioned setting, too much outdoor humidity can prevent the taffy from forming the way it should. Ideally, it should not be raining and the air should not have high humidity. To try a variation, see what happens if you add 1/8 teaspoon of baking soda before spreading the taffy out. This variation will result in the creation of many tiny bubbles of air in the taffy which will have a very light texture. ½ teaspoon salt on medium high heat. Heat the mixture in a saucepan over medium heat. 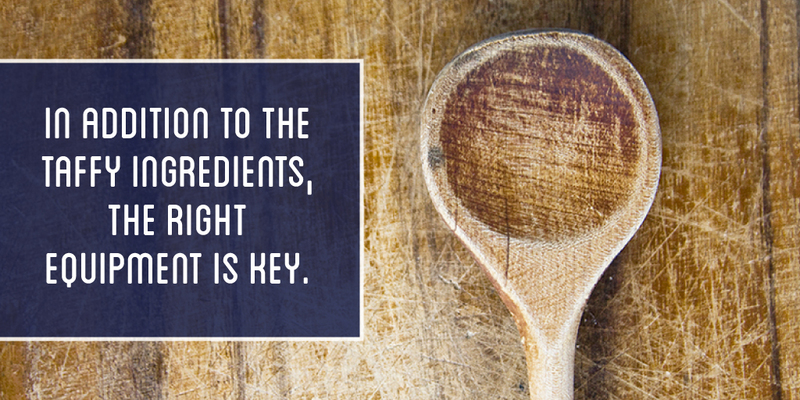 Before the mixture reaches the boiling point, you should keep stirring it with a wooden spoon. After it begins to boil, let it boil without disturbing it until it reaches 255 degrees Fahrenheit. You should take a pastry brush with warm water and brush it down the sides of the pan as the syrup continues to cook. Once the temperature reaches 255 degrees Fahrenheit, remove from the heat. Take the pan off the heat, and then add one tablespoon of vanilla paste to the mixture. Pour the mixture into the greased baking dish. After nonpareils have been sprinkled on the taffy and it has cooled, the pulling can begin. Grease your hands with butter or oil and keep pulling the taffy until it is has a gloss which is satiny and a color that is light. Doing the pulling with a friend will make this step go much more quickly. The more you pull, the softer and chewier the texture will be. The taffy will become lighter in color the more it is aerated. Ideally, the aeration process will take between fifteen and thirty minutes and will make the taffy much tastier. The process of pulling taffy adds air to the taffy mixture, which in recent years has been made from corn syrup and sugar. The process of adding air to the taffy is important to keep it soft. Adding the aeration to the taffy will also make it lighter and chewier. In years past, taffy was also made from molasses, which was boiled and then cooled and pulled or made into squares. It could then be twisted into various rope-like shapes, including braids. This final step of taffy pulling is extremely important as the pulling is what creates the soft and chewy taffy texture. The pulling consists of stretching the taffy and folding it over and over again until it tires out the person who is doing the pulling. Once the aeration process has been completed, the taffy can be shaped into a long rope. Cup the taffy into bite-sized pieces with well-buttered scissors. Then wrap it into small wrappers of wax paper and twist the ends. After buttering two large cookie sheets, combine all ingredients in a saucepan except for the Kool-Aid. Boil mixture until it reaches 250 degrees Fahrenheit. Once removed from the heat, add the Kool-Aid powder. After the mixture is cool, you can shape it with your hands and will need to pull it until it becomes lighter in color. Once this happens, roll the taffy into a long rope and then cut it with buttered scissors. It can now be wrapped into wax paper. In addition to the taffy ingredients, the right equipment is key. You need a three or four-quart heavy saucepan, a long-handled wooden spoon, a brush used for pastries, and a quality candy-making thermometer. It will be messy, so consider drop cloths sprinkled with flour to protect floors and shoes. Wax paper taped down to the countertops will also help make the whole taffy pulling process less messy and easier to clean. Taffy may come in many different flavors with some of the most unusual being jalapeno and cantaloupe. There are easily over 100 flavors available from various companies. May 23 is National Taffy Day in the United States. 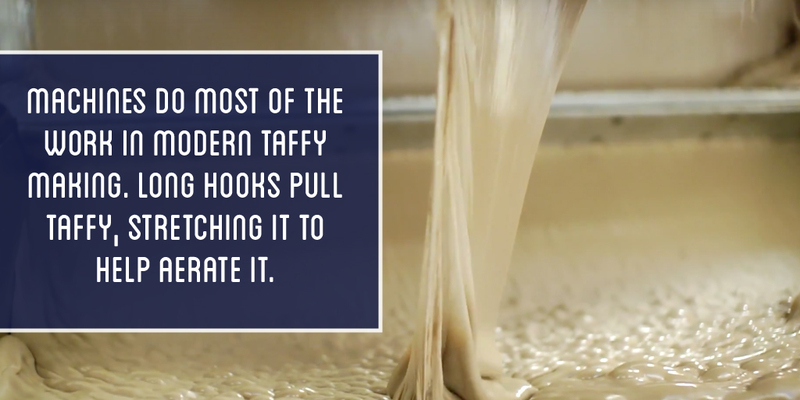 Thanks to modern manufacturing, 1,000 pieces of taffy can be made in a minute. 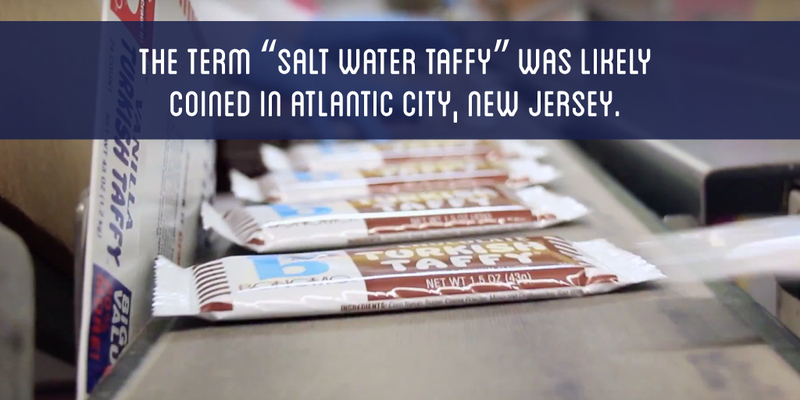 It only takes one hour to make enough taffy to cover 1/3 of the length of Atlantic City. When Topps baseball cards were first introduced in 1951, taffy was included in the pack. Unfortunately, cards’ varnish tainted the taffy, so Topps later switched to gum. The Warrell Corporation employs a unique taffy making process. We whip egg whites to make salt water taffy, Bonomo Turkish Taffy, and flipsticks and make up to 4 million pounds of it per year. We have been in business for over fifty years and consistently employ the highest in quality control in our manufacturing process. We have also been chosen as a supplier of food products to top worldwide companies. Please contact the Warrell Corporation for more information on our taffy-making capabilities.